Automating the management of network devices is extremely crucial in agile environments and Puppet modules can be used build on the existing framework using the Puppet Device feature to provide support for administering the Barracuda WAF. 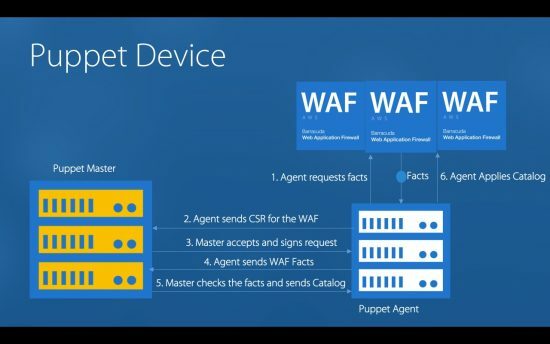 There is no need to install an agent on the WAF with this approach, and takes advantage of the Puppet Device subcommand that’s operated from a standalone Puppet Agent that communicates with the Barracuda WAF REST API v3. Barracuda WAF can be configured to process traffic for a Web Application, block malicious traffic, Load balance backend servers etc, using this module. Puppet bridges the gap between an UI driven management process and a script driven API invocation and provides some inherent benefits that are part of the Puppet Enterprise suite to the forefront for a barracuda WAF administrator. This includes querying the WAF for custom facts using the Facter daemon, using the Puppet resource subcommand to query the WAF for a particular piece of configuration. In this blog post, we will explain the process of installing the cudawaf module, configuring the connectivity and using Puppet manifests to manage the WAF. The Puppet device subcommand is a feature in Puppet that allows managing devices that cannot install Puppet agents on themselves. The WAF units are managed through intermediate proxies which are actually Agents connected to the Puppet Master. The agent has the certificate for the WAF unit to be managed and authenticates on behalf of the WAF to apply the catalog rendered from the Puppet master. Handling dependencies is critical to work with the module. We need to install the dependencies on both the master and the agents before running the puppet commands. In some cases, external dependencies can cause errors such as "Error in retreiving resource statement". Increasing read and execute permissions to the gemspec on the master can help solve this problem. Please note: After you are changing permissions, please remember to restart the puppetserver daemon. To use the module, first configure a Puppet agent that is able to run puppet device. This agent will be used to act as a "proxy system" for the puppet device subcommand. The body of the section should contain a type directive (use cudawaf) and a url directive (which should be an HTTP URL pointing to port 8000 to the device’s interface, typically the WAN interface). With this manifest, a service with the name “Myservice2” will be created on the WAF under which there will be a content rule called “ContentRule1” and a backend server for the content rule called “rgServer1”. The WAF is also connected to the Barracuda Cloud Control for the administrator to use other additional cloud services available on the BCC portal. You may visit the WAF documentation website, campus.barracuda.com for more information on each of these configuration items. At this point, you may login to the Barracuda WAF web interface to verify if the configuration has been updated as per the manifest.